Weather: 60°F (16°C) in the morning; got up to 80°F (27°C) by the end of the ride at 4:00pm. Clear all day. Geert left us this morning from the campsite. 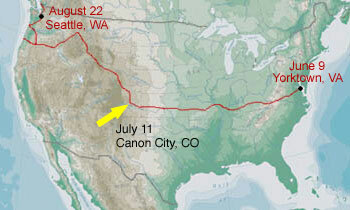 He's headed to San Francisco via the Western Express route instead of continuing on the TransAm since he's on a tight time schedule. Joe and I started our climb out of the Lake Pueblo State Park at around 5000 feet and peaked out in Wetmore around 6200 feet. We then had a fast 11 mile descent into Florence which lies at 5300 feet. This is just a taste of what we have coming up. The grades here are not steep but are very long. Here are a few shots from this morning. 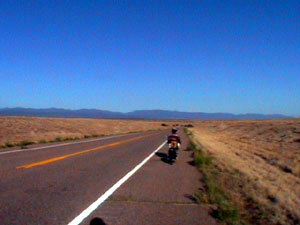 The first is of me riding toward the mountains just west of Lake Pueblo. 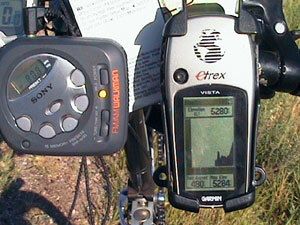 The second is of my GPS when I first hit 5280 feet above sea level (one mile high). 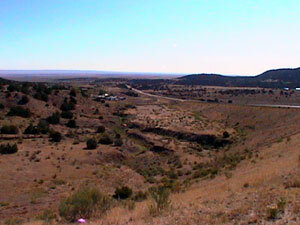 The third shows the typical grades of mountain passes out here and the fourth is looking down into a valley just east of Wetmore. We met two eastbound TransAm riders on our descent from Wetmore. One is from England and the other is from The Netherlands. Too bad Geert didn't get to meet them since Geert is from The Netherlands too. They seem to be doing very well and are happy to be out of the mountains although they said the grades we very manageable. They warned us about the hard breathing at high altitude. I stopped by the Bike Depot bike shop in Canon City (pronounced canyon) to see about getting some lower gears for my bike. Ever since the Appalachians I've been in search of lower gears so I can spin up the mountains easier. In Carbondale, Illinois I bought a new cassette that made a difference. Today I hit a gold mine by getting a new chainring on my crank. I was running with 36, 46, and 58 tooth rings up front. I never use the 58 tooth ring when touring so I've been searching for a small chainring with the correct bolt pattern for a 7 speed drivetrain. The Bike Depot had a 30 tooth ring that fit so I had the 58 tooth ring taken off, the 36 and 46 tooth rings moved outward, and the 30 tooth ring put on the inside. 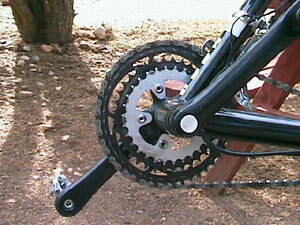 After removing two links from the chain and some quick cable length and derailleur adjustments I was on my way. The new ring in combination with the new cassette I bought in Illinois finally make even the steepest hill manageable. It's still difficult to balance the bike at low speed but I've become more proficient at it. Joe and I met Sarah Smith, another TransAm rider, at the Bike Depot. She stopped by to buy a mirror and we struck up a conversation. We've been chasing Sarah and the group of five other riders she is traveling with for quite a while. One member of their group, Corrin, was with Joe early on in Virginia and Joe is looking to catch up with him. It is always awkward catching up with riders because we know so much about them from the log books in hostels, stores, and restaurants along the way but they know nothing about us. For instance, I've seen Sarah's entries in at least 10 log books so I know what she ate, where she slept, and how long she rode during many days but there's no way she has ever heard of me. She and her group are doing a zero day in Canon City so they can go rafting. She mentioned that she may break away from the group to ride faster since her schedule is a little tighter than the rest of the pack. 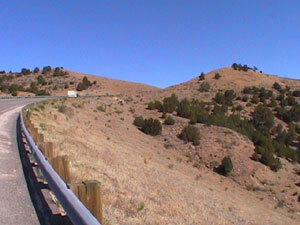 We rode up to the Royal Gorge area at 6300 feet and stayed at a KOA campground. We picked this one because they have a free shuttle to the gorge which is supposed to be spectacular. There is a footbridge that crosses the gorge and it's the tallest suspension bridge in the world, rising 1500 feet above the canyon floor. The last shuttle left just a few minutes before we arrived and it costs $17 per person to see the gorge. We passed on the opportunity and figured that we will return some day in the future to see it.